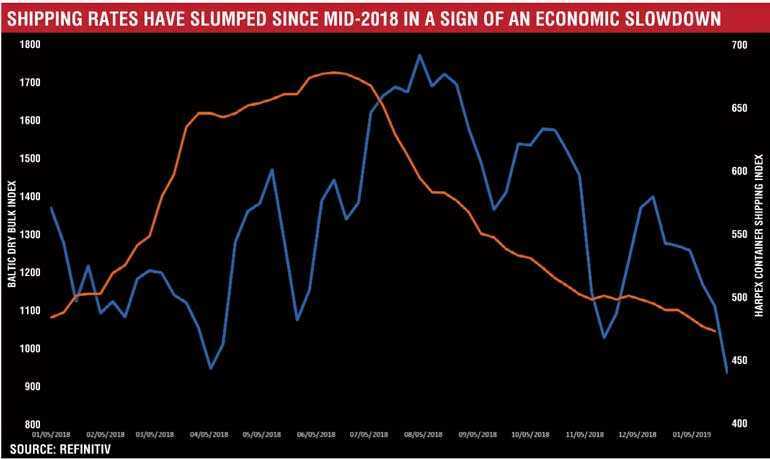 SINGAPORE (Reuters): Freight rates for dry-bulk and container ships, carriers of most of the world’s raw materials and finished goods, have plunged over the last six months in the latest sign the global economy is slowing significantly. “Signs that the US and China remain well apart in trade talks continued to weigh on sentiment in commodity markets,” ANZ bank said in a note on Friday. This was after US Commerce Secretary Wilbur Ross said on Thursday the United States and China were “miles and miles” from resolving their issues. The Baltic index has lost a quarter of its value since the start of the year, and dry-bulk is not the only shipping market under pressure.The Harpex Shipping Index, which tracks container rates, has dropped by 30 percent since June 2018. “Slowing global economic growth, the unresolved US-China trade conflict, the US government shutdown, and Brexit drama are all sources of uncertainty dragging at sentiment,” said Hussein Sayed, chief market strategist at futures brokerage FXTM.In the euro zone, a survey published on Thursday showed that business growth nearly stalled out at the start of 2019 as trade tensions and political woes meant incoming new work fell for the first time in over four years. Asian industrial powerhouse Japan posted similarly weak manufacturing data in its own survey this week.In China, the National Development and Reform Commission (NDRC) last week warned the downward pressure on the economy would impact its job market as falling factory orders point to a drop in activity in coming months.The United States has so far been in a better shape than other leading economies, but even there, manufacturing indices have been reflecting weakness since late 2018.